FLIR's infrared camera | Pocket NC's tabletop CNC Machine | Blackmore Sensor's 3D imaging | a hologram from MSU | BHS's Robotics Team | an Observatory to see the stars | a Virtual Realty exhibit | a Fire & Ice display | Chemistry of Cocktails | NASA's High Altitude weather balloon | 3D design & printing | the Flight lab | A robotic arm exhibit | ... and more! This cocktails and appetizers event will have displays and experiments for you to experience in a hands-on way while raising money for the Children's Museum of Bozeman. 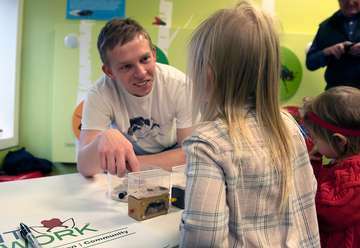 Show your support for Bozeman's science center during the cash call. Cocktail & business attire welcome! **Dino Drop-in is open late for kiddos of attendees! Contact the Children's Museum for more info. Ignite creativity and creative thinking for kids in Bozeman by attending our premier event!